What exactly is this robot thinking? Our future robot overlords seem to be taking their time in rising up and enslaving humanity, but we're seeing slow and steady progress in the capabilities of these AI-powered machines, and researchers at the University of Texas at Arlington have just made a new breakthrough. The UT Arlington engineers have just patented a technique in which software can learn from its mistakes and adapt its processes instantaneously. That's a significant step forward from code which previously had to stop and 'think' about what had happened before moving forward. In the real world, it could lead to something like an autopilot system in a plane or a self-driving car reacting to changes in a split-second: the software is able to 'see' what's happening and tweak its approach if necessary, with everything happening autonomously. The new process is called Integral Reinforcement Learning and means robots will be able to better fend for themselves away from human control - these machines are traditionally not very good at dealing with unexpected events they haven't been programmed for, but this new approach should help change that. The researchers behind the new technology say it can help save time, energy and fuel in a variety of different industries and scenarios, including transportation: "By increasing the efficiency of various modes of transportation with the IRL smart controller, we make it possible to move goods and deliver services less expensively and with less negative impact on our environment," said Khosrow Behbehani, dean of the UT Arlington College of Engineering. The system was developed by UT Arlington Research Institute professor Frank Lewis, together with United Technologies scientist Draguna Vrabie and University of California research scientist Kyriakos Vamvoudakis. 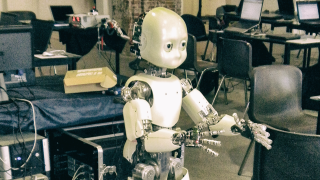 Should we let robots have children?